Not really “adventure” related, but definitely Minnesota-moto related; The Indian Motorcycle company was purchased by Medina based Polaris last week. Indian had been struggling and it will be interesting to see what Polaris does with them. Sounds like manufacturing will move to Iowa though, not Minnesota. Full Press release here. This Thursday at 9Pm is our monthly “virtual meeting”. Everyone is encouraged to call in and catch up on the latest news and events. See the Events page for Phone # to call. Agenda will include: Upcoming events, Trail updates, Update on work with the DNR, discussion on membership with District 23 ARMCA, and more. 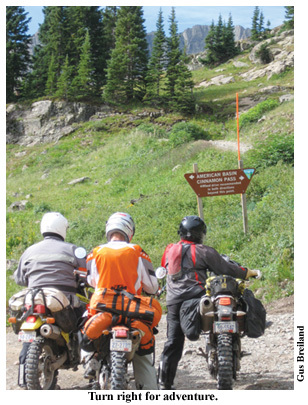 Some guys from Minnesota Motorcycle Monthly rode the Trans-American Trail and did a nice write-up in the April issue. I encourage you to pick up the latest copy of MMM as always. Its a great way to stay up on moto-related events in the state. And if you see any of the MMM guys out riding tell them to do a story on the TMAT next! Michigan. Click the pick to link to their website. Quite a large Dual Sport event if you can road trip to Michigan. Midwest Mountaineering has its annual Outdoor Adventure this weekend at the their store and nearby at the U of M campus. This is a great opportunity to learn new camping skills and see the latest gear. See http://www.outdooradventureexpo.com/201104/Index.shtml for more info, directions, and schedule. You are currently browsing the Minnesota Adventure Riders blog archives for April, 2011.